The snowdrops were wonderful in 2008, lasting well into March. By now, the sun was out more often, and to stand at the foot of the path in Hapton churchyard was to smell, and to hear, and to feel Spring beginning. The mound shape of this tiny graveyard suggests an ancient place, probably of pre-Christian significance. 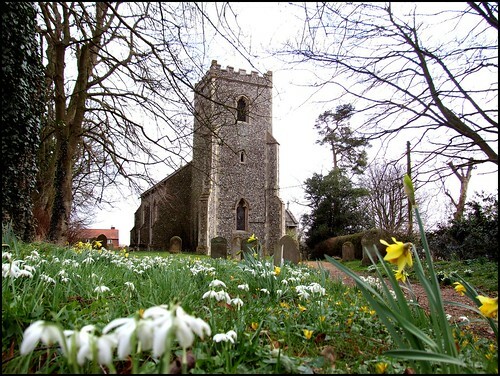 As with most of the little churches around here, it is unlikely that St Margaret impinges particularly on the radar of too many church explorers. The tower is entirely Victorian, and the rest of this small building has been made shipshape and crisp by the last century and a half. Stepping inside is like entering an entirely Victorian church, although without the special rural atmosphere of nearby Wreningham, for example. That said, the building is beautifully kept, and there are a number of idiosyncracies that buoy the spirit. One is a huge cross on the north chancel wall, made out of peacock feathers. Facing across from it, on a window sill, is a sheaf of wheat twisted and splayed into a dramatic symbol. The curiously tall, pointed tower arch is presumably a work of Victorian fancy, but the lower stonework, at least, looks old. The font is a plain late-medieval piece, the font cover from a century and a half later, both of them unusual enough to catch the eye. They work as a counterpoint to the relative plainness and anonymity of the rest of the nave. There are two unusual medieval survivals. One is outside, the 13th century iron work on the 19th century door. There is no reason to think that it necessarily came from Hapton originally, but it is extraordinary to think that it was already more than half a millennium old when the Victorians took Hapton church to task. The other is more significant. The chancel arch has gloriously floriated capitals, probably dating from the early decades of the 14th century. If you look up closely at the one on the north side, you will see a green man grinning back at you, a silent witness, the saving remnant.